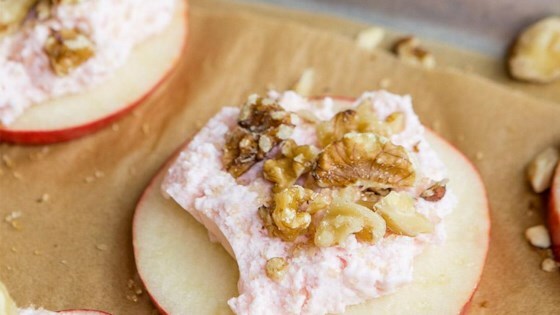 "Here's an easy after-school snack: apple slices are spread with strawberry yogurt and sprinkled with chopped nuts and a dusting of sugar." Using an apple corer, keeping the apple whole, core the apple straight down. Discarding the bottom and top slices, cut the apple crosswise into 6 slices and spread on a cutting board. Spread the slices with strawberry yogurt and sprinkle with nuts and sugar. Serve.